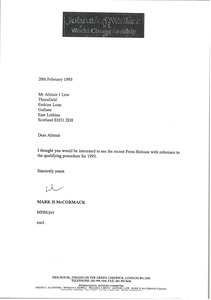 Invitation to the Johnnie Walker International Advisory Committee meeting at Gleneagles, Scotland in June 1993. Under discussion will be planning for future Johnnie Walker World Championships after the successful 1992 event. 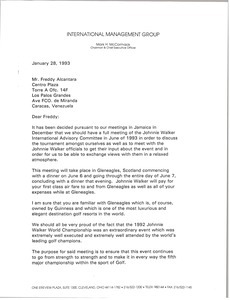 Forwards the press release for the 1993 Johnnie Walker World Championship in Jamaica, calling attention to the qualifying procedure.